L’apparenza inganna, as they say here in Italy – appearances can be deceptive. Today’s offering is a case in point. 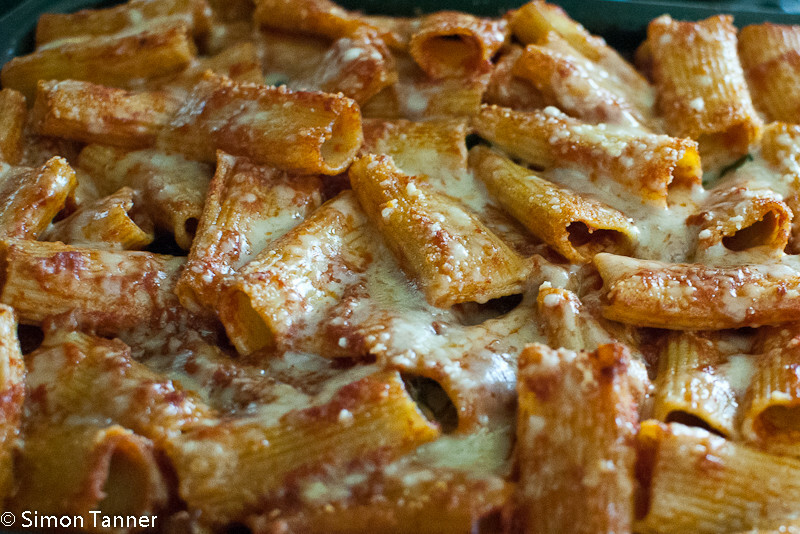 I mean, just look at it – rigatoni and cheese with a crispy crust. This is the sort of pasta dish you wouldn’t mind introducing to your parents. Reassuring, well-behaved, understated even. It’s not exactly a featherweight prawn salad, but neither does it look likely to beat you up and put you out of action for 24 hours. This, of course, is where you would be wrong. Prise off its pretty golden wrapping, and underneath you will find the Mike Tyson of the pasta universe. This is something I never actually cook myself. Partly because if I feel like baked pasta comfort, then it has to be lasagne for me; nothing else comes close. But variety is the spice of life, as they say, and I’m not one to stick solely to the old favourites. So, yes, I have to admit, there are more serious obstacles between me and pasta ‘ncaciata, the first being when is traditionally eaten, i.e. on Ferragosto, the 15th-August bank holiday. Even I am not so far gone that I have any intention of slaving over a hot stove for hours when it’s 35°C outside. It’s idiotic enough to eat this kind of food in such heat, let alone make it. Which brings us to what is for me the deepest mystery surrounding pasta ‘ncaciata, and the second reason why I tend to steer clear. 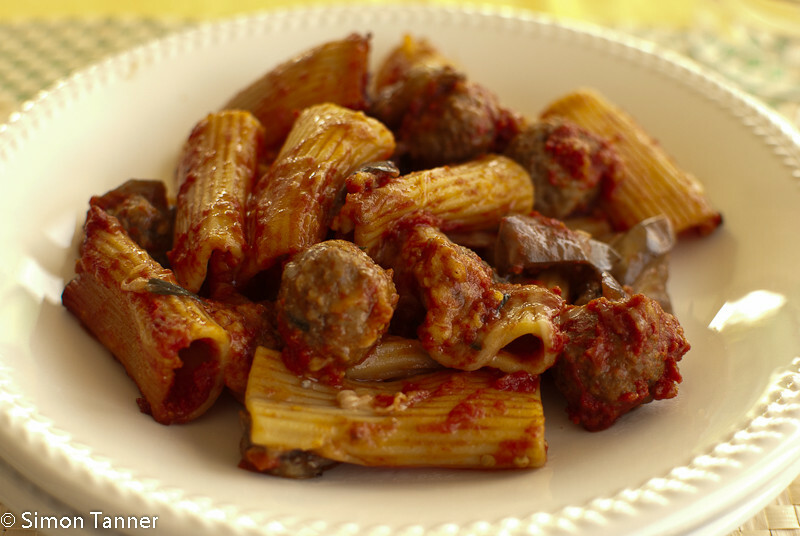 What on earth would possess anyone in their right mind to prepare and eat a dish that, in its traditional version, involves pasta mixed with tomato sauce or ragù, meatballs, salami, chunks of cheese, sliced hard-boiled eggs and fried aubergines? The original recipe (which apparently dates back to the 18th century) even included chicken meat and livers. Did I forget anything? Kitchen sink, maybe? Each area in Sicily has its own variant (the ragù used may be based on kid or sausage in the mountains, for example), but the basic idea seems to be the same – how can we possibly get as much animal protein, saturated fat, fried food and carbs into one dish? This is the sort of bloody-minded approach to cookery that Attila the Hun might have engaged in, had he felt moved to don a chef’s hat. I might contemplate something like this after a day’s trekking through the fjords of Norway in January. Tackling it in tropical temperatures in the middle of a Sicilian August is pure lunacy. A final point: this is not to be confused with another local dish, pasta al forno, i.e. the standard Sicilian baked pasta. The ingredients are similar but not quite the same, and in pasta al forno should be layered, while here everything is mixed indiscriminately and bound together by the melted cheese. And whilst on the subject of cheese, it is thought by some that the name ‘ncaciata comes from the type of cheese used, cacio, making this, literally, “cheesy pasta”. More likely is that it comes from cascia, the covered oven dish in which it was traditionally cooked, in the embers (in fact, in some parts of Sicily, it is known as pasta ‘ncasciata rather than ‘ncaciata). Preheat the oven to 180°C (160°C if a fan oven). Cook the pasta until al dente, no more – remember this will finish cooking in the oven. Drain the pasta and mix in an oven/serving dish with the tomato sauce, fried aubergines, meatballs, salami and the diced cheese. Tuck in a slice of egg here and there. Sprinkle over the grated cheese and finish with a drizzle of olive oil. Bake in the oven until the cheese is golden and the pasta has started to crisp (15-20 minutes should be easily enough). Drink the grappa. Either before eating, to steel yourself, or afterwards, in the vain hope it will aid your beleaguered digestive system. Or both, of course. This requires a Sicilian red with some body. There’s no way you’re going to do anything remotely approaching activity for the rest of the afternoon, so go with the flow, and uncork a good Nero d’Avola, a Cerasuolo di Vittoria, or even an Etna Rosso. This entry was posted in Pasta, Recipes and tagged ferragosto, pasta, pasta 'ncaciata by hungryenglishman. Bookmark the permalink.